Piriformis syndrome is quiet tricky and if not addressed soon, it can become reoccurring. Nevertheless, the condition is usually reversible with the right care and stretches. Learn how you can beat piriformis syndrome pain from home. 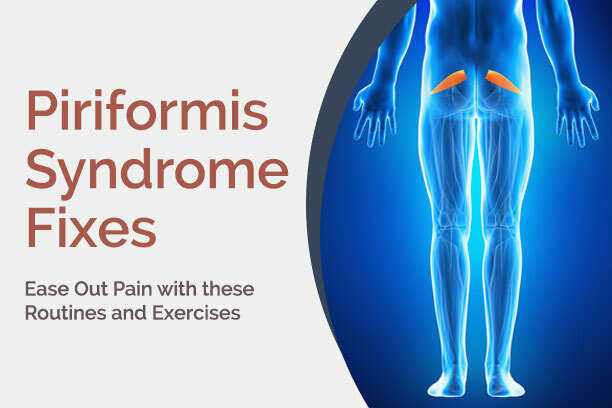 Piriformis syndrome’s symptoms may include painful buttocks, aching lower legs, and burning or tingling pain which may worsen when sitting for a long time or during activities. The most common cause of piriformis syndrome is shortening or tightening of the piriformis muscles due to either biomechanical inefficiencies or training errors. Training errors such as running on hard surfaces, increased activity intensity, getting back to intensive sport after a long period of sedentary lifestyle and wearing the wrong footwear may cause this condition. Faulty body mechanics, poor posture, bad sitting habit and gait disturbances may also lead to piriformis syndrome. Effective piriformis syndrome treatment begins with proper first aid. The first 48 to 72 hours of the injury is critical and pain experts suggest RICE therapy (RICE stands for Rest, Ice, Compression and Elevation) as first aid for this condition. Doing the RICE principle helps for better and fast recovery. Rest is essentially needed the first 3 days of injury. Ice the painful area after an activity caused pain. After the first 24 hours, alternate heat and ice therapy for better blood circulation. Compression and elevation also help reduce the amount of blood flow to the injured area, accelerating the healing process. Lie on your side with back straight and one foot laid top of the other. Keep your knees in line with your back. Slowly bend your knees without bending your spine. Now lift your top knee, slowly moving it away from your bottom knee without lifting the ankles. You should feel stretches on your hips not the pelvis or back. Repeat the movement 10 times. Place both hands behind your head. Straighten elbows so they are in line with the shoulders. Slowly squat down until your thighs are parallel to the ground. Jump high. When you get back to the floor, repeat the routine. Lie on your back with legs laid straight. Slowly lift the affected leg, bending the knee. Use your opposite hand to reach across your body and gently pull your knee towards the opposite shoulder. Hold this stretch for about 30 seconds and repeat the other side. Do 5 stretches for each side. Lie flat on your back. Keep both feet flat to the ground. Slowly bend your knees. Place your right ankle to the knee on the left leg. Pull your left thigh towards your chest. Hold for about 30 seconds. Repeat on the other side. Flexibility: To do a simple piriformis flexibility stretch, stand with feet at shoulder-width apart. Keep the right heel on the ground and rotate toes to the left then back to the starting point (pointing ahead). Repeat both feet 10 times. Strengthening. It’s about strengthening the rare muscles. Begin by putting an ankle weight on your thigh then bend the right leg at a 90-degree angle. Keep the right hip and shoulder on the ground and lift your right leg. Cross the right leg over the center of your body. Hold this position for a second then go back to the starting position. Do this stretch for 10 times on both legs. Some patients may feel extreme pain or discomfort may not be able to perform these exercises. If you are in this situation, the best step is to consult a qualified clinician who can evaluate the right piriformis syndrome treatment according to your specific needs. Contact Body Restoration for a no obligation appointment and learn about the right piriformis syndrome treatment for you.